Joyce Guiness is one of the most established recruitment agencies in London, having been set up over 45 years ago we have gone from strength to strength, whilst keeping a firm grasp on our core values. We are a boutique agency and we intend to keep it that way, believing that this is the best way to cultivate relationships with both our clients and our candidates – resulting in the right jobs for the right people. After graduating from Northumbria University Pip travelled before settling into her career in London. During this time Pip worked for the CEO of an IT Network Management Co were she was seconded to San Francisco for the IPO. She worked for the GM of The Harbour Club and then did European Marketing for a telemedicine company. In 2003 Pip joined Joyce Guiness as a Permanent Consultant and quite frankly hasn’t looked back. In 2006 she was made a Director, taking over as MD in 2008. Ingrid graduated from UCL in 2002 with a BA Hons in Management Studies with Scandinavian, having spent her second-year at Lund University in Sweden. She went on to work for the Swedish Embassy, before working as a PA and as a Marketing Coordinator. Following this, she moved to Asia where she set up a catering company selling Western food to restaurants in Malaysia. On her return to the UK, she approached Joyce Guiness for temp work but was snapped up to help run our Temp Desk instead. She now successfully looks after both Temp and Perm roles. Jessie Mack - Jessie has a degree in Criminology and Sociology from UWE, which shecompleted in 2008. She then headed off to do a ski season in Meribel, where shewas a chalet host extraordinaire! On her return to the UK she worked for aproperty company, before joining Joyce Guiness in 2010. She manages to juggleworking on both the temp and the perm side. Lucy left Bradfield College in 2008 and then took the opportunity to travel the world and see some places before University. On her travels she ended up teaching English in an Orphanage in Cambodia which was the most amazing experience. She loved her time with the children and is still in touch with them today. Lucy then secured a place at Leeds University to study BSc in Sports and Exercise Science which was a fabulous 3 yrs. At Uni she played Netball and generally made the most of University life! She graduated in 2012 and joined the Joyce Guiness team in November 2012. 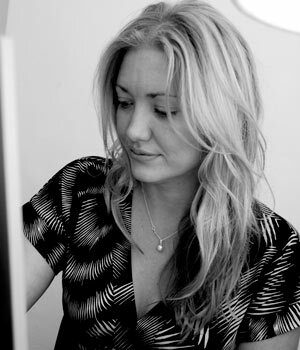 Clare graduated from University West of England in 2007 with a degree in Marketing. Before embarking on London, she whisked herself to New York where she did a quick stint in Film Production and on her return to the UK she worked for a media company bringing together PR’s and Journalists. She was there for 2 years before moving into the fashion world where she worked as a model agent for four years, with some of the world’s top models. 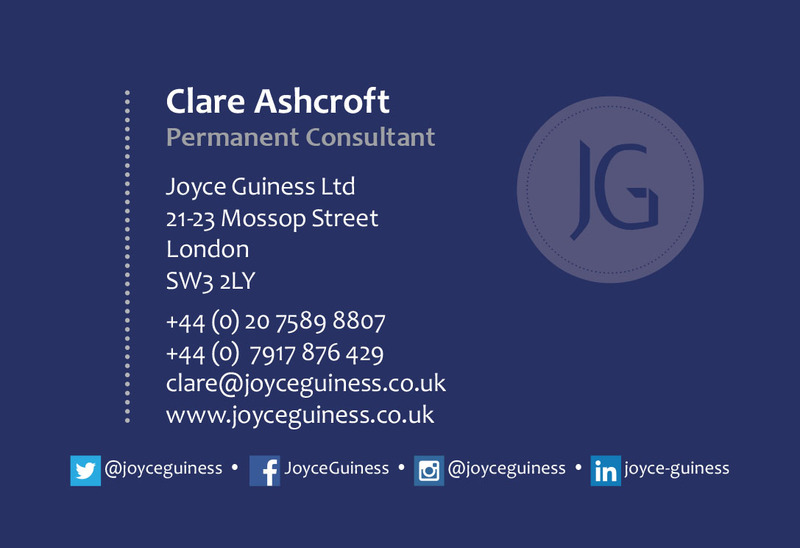 Clare joined Joyce Guiness in the summer of 2014 as a permanent consultant. Kate has a degree in Philosophy from Durham University, which she completed in 2007. She then spent two years working in the financial sector, firstly as an analyst in a corporate finance and advisory firm followed by working as an account executive at a financial PR company. Kate then spent six and a half years working as a PA in the Royal Household before joining an Executive Search firm, a job she enjoyed for a year, before joining Joyce Guiness as a permanent consultant in May 2017. Louisa graduated from Oxford Media and Business School in July 2018 with an Executive Personal Assistant Diploma. Prior to this, she spent a year working in various different industries in Scotland as well as taking the opportunity to travel to other parts of the world such as South East Asia. Louisa joins us to support the running of the office and to coordinate our social media. Indy graduated from Quest Professional in 2017 where she was studying on the Professional Diploma Course. Before this, she spent time working in retail and travelling around Australia, New Zealand and Thailand.After graduating from Quest, Indy spent over a year working at a Prep School in Notting Hill as an Assistant Secretary. She has joined us as a Resourcer and Office Coordinator. Shaun Lawson’s career began in stockbroking. He worked for a number of years at Laing & Cruick shank in London, UK, reaching the position of a senior corporate finance partner. In 1975, he established a venture capital and consultancy business under the name of Lawson & Partners Limited. He has been involved in the venture capital market for over 30 years and is a Non-Executive Director for a number of companies both in the UK and the USA.